In a press release this week, The New Museum announced the list of artists participating in its upcoming 2015 Triennial. Titled "Surround Audience," the Triennial kicks off on Feb. 25 and will through May 24. Co-curating the show are New Museum Curator Lauren Cornell and artist Ryan Trecartin, one of the most influential artists of the last decade. According to the museum, the exhibition will feature sound, dance, comedy, poetry, installation, sculpture, painting, video, and an online talk show​, many of which have been commissioned specifically for the show. In describing their third installment, the New Museum writes that this Triennial "explores how artists are currently depicting subjectivity, unpacking complex systems of power, and claiming sites of artistic agency." The roster this year includes 51 artists and artist collectives from over 25 countries, including New York-based DIS collective who have been named as curators of the 2016 Berlin Biennale. 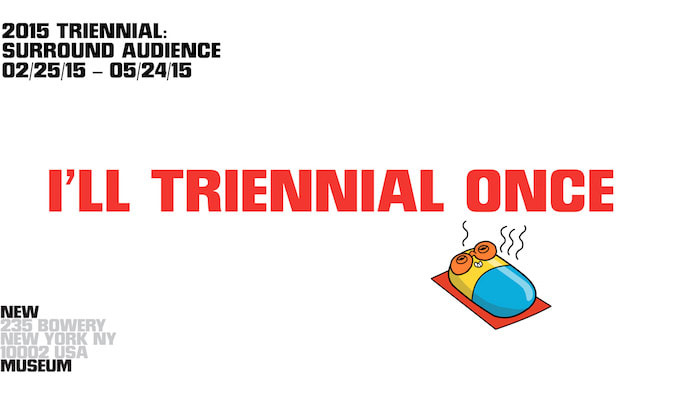 For more information, head to the 2015 New Museum Triennial exhibition page.